Policies - Bluegrass Playgrounds, Inc.
Our prices are subject to change and do not include delivery and installation cost. 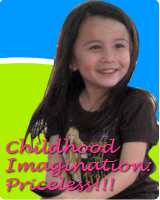 Ordering with Bluegrass Playgrounds is simple. If you are a government institution, you'll just need a signed purchase order and if available a copy of the quote given to you faxed to our toll free fax number (1-866-271-4011). Terms will be 30 days net. All other customers can either order over the phone with a valid credit card, advance check or apply for credit application. All orders must exceed $30 or a handling charge will apply. Orders will be ship unassembled unless otherwise noted. Your location should be accessible to large freight truck if ordering bigger playground equipment. The carrier is not responsible for unloading. Residential delivery, call ahead and lift fate service are available for extra charge and should be specified when ordering. Customer's responsibility is to check to see that they are receiving the same number of cartons, bundles, pallets, welded frames,etc indicated in the delivery receipt. Do not sign the bill of lading unless you have counted and inspected the items. Note any shortages or visible damage on your receipt and have the driver note it also.No notation means there is no recourse for any damages or shortages noticed after the shipment was receive. Trucking companies don't accept damages after the fact. The only way we can file a claim to get you a replacement is when the damages or shortages is noted in the delivery receipt. If there are concealed damages, please contact Bluegrass Playgrounds Customer Service at Toll Free1-(800)-828-9690 right away. You are given 5 days from receipt to report concealed damages. If possible, take photographs to send to us. Cancellations fees of 25 % may apply if expenses have been associated with the order. Custom color orders who need to change color choice will pay the fee. No cancellations are allowed on orders that have shipped. We do not collect taxes unless you are private or residential customer who resides in Nebraska, Iowa or South Dakota. All government customers are exempted from tax charges. You may send your exempt tax certificate copy when ordering. Returns will not be accepted without prior written authorization. Returns should be within 30 days from the date the equipment is received. Restocking charges of 25% and freight charges to and from your location will apply. Absolutely no returns on equipment that has been installed , custom orders and on woodcarpet surfacing. Due to the possibility of typo errors on this website or on our catalog, as well as fluctuations in raw material costs, prices, and descriptions are subject to change without prior notice. All items are warranted by the manufacturer. Bluegrass Playgrounds does not warranty products personally. You may request from us to send you any warranty information that you may need from the manufacturer . 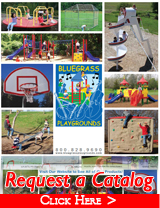 Bluegrass Playgrounds disclaims liability for any loss, injury, or damage arising from the use of an item sold by us. Any item delivered to be proven defective under warranty will be replaced. Warranties apply to structural failure caused by defective materials or defective workmanship, and with normal use and proper maintenance and installation. Damages from misuse, vandalism, lack of maintenance, improper installation, unauthorized repairs or modifications, acts of God or acts beyond manufacturer's control, or cosmetic issues such as scratches, dents or fading of colors, are not covered by the warranty nor does the warranty cover the cost of freight or labor for removal and installation of repaired or replacement parts. Warranties are limited to repair or replacement of defective parts. A repaired or replacement part is covered only for the original warranty period. All warranties begin on the delivery date of the goods. Warranties are non-transferable. A soft resilient surface should be placed under all playground equipment to cushion accidental falls. The "use zone" to be covered and depth of cushioning vary with the type and height of equipment,as described in section 10 of the Handbook for Public Playground Safety published by the Consumer Products Safety Commission. www.cpsc.gov. It is important for all owners and users to follow these guidelines. Manufacturers cannot accept liability for playground that is improperly installed, improperly maintaned, or improperly used.